Mailspect Defense protects email gateways and servers from spam, viruses, phishing, fraud and Internet attacks. It includes a best-of-breed control panel called Mailspect Manger that is used to configure, monitor and update a multi-layered suite of defenses. 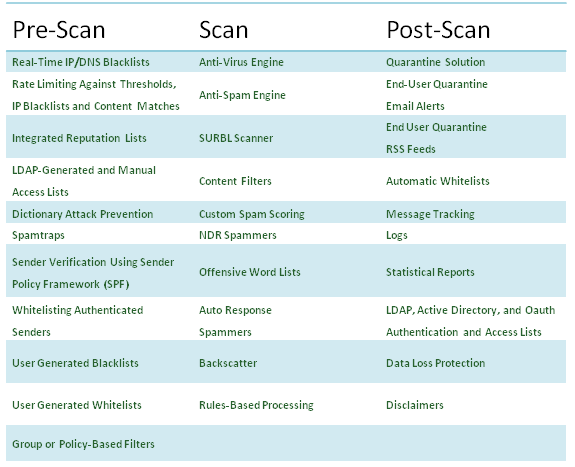 Mailspect Defense protects your organization from the ever evolving threats on the Internet at the pre-scan, scan and post-scan phases of email processing. Using a high-speed, scalable daemon called mppd and a state-of-the-art quarantine solution called Message Viewer, Mailspect Defense offers email security for businesses, governments, schools and Internet Service Providers (“ISP”). Mailspect Defense includes the proprietary Email Stream Management scripting language that is used to configure custom email filtering, routing and data extraction/insertion workflows. It includes an API that integrates seamlessly with custom control panels for one-click user and domain management. Mailspect Defense puts the control of dozens of email security techniques, technologies and analytics in the hands of the systems administrator. Mailspect Defense’s feature list is extensive and continually expanding in response to customer requests. At the core of the system is a Policy Engine that lets systems administrators set up policies based on email address, content, LDAP directory groups by address or domain and email direction –incoming or outgoing emails. Mailspect Defense provides a control panel where the email admin can track performance and view analytic data on the emails flowing through the platform. For the end-user, Mailspect Defense provides an easy-to-use quarantine solution accessible via browser or email alert. End-users can Remove, Deliver, Forward, Reply, Save to Desktop, Export, Report False Positive, Print, or Add to Whitelist or Blacklist with one mouse click. Mailspect Defense includes Email Stream Management (“ESM”), a web services scripting language that speeds the development of custom solutions that extract business value from the email stream and insert that information into core business systems. ESM uses pre-defined fixed and flexible programming engines and modules in a pipelined architecture to quickly build email importing, parsing, filtering, routing, modifying and exporting algorithms. The scripting language includes more than 150 common macros that can be combined with the engines to create custom workflows. 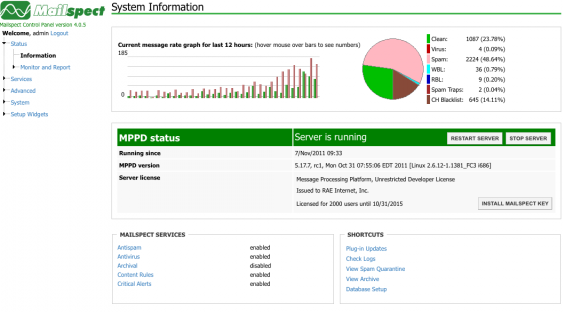 The newest addition to the Mailspect message processing platform or MPP is the API. The API can integration custom control panels seamlessly with Mailspect Defense to enable one-click provisioning of users and domains. Mailspect’s customer base is extremely loyal, with near perfect renewal rates. Mailspect Defense is not just a product; it is also a professional services offering including some of the best antivirus and antispam experts in the world. Support and configuration via email are free and the real-time support staff is responsive via SKYPE and GoToMeeting. Mailspect Defense is unique in its ability to combine flexibility with effectiveness in one easy-to-use platform. The bottom line is that Mailspect Defense is faster, more accurate, more sophisticated and less hassle to administer than Open Source Linux spam and virus filters and much more flexible than rigid, single-point email filtering appliances. • Mailspect Basic includes all of the features and technologies developed by Mailspect. It relies on Open Source scanning engines: clamd and Spamassassin. • Mailspect Standard includes the Cloudmark anti-spam and anti-virus scanning engines for higher throughout and accuracy. Mailshell is provided for Mac OS X. • Mailspect Defense works with Red Hat, Suse, Debian or Ubuntu 32-bit and 64-bit commercial and/or Open Source versions out-of-the-box. • Mailspect Defense works on the Apple platform under OS X on an x86 machine. • Mailspect Defense can be ordered as a dedicated cloud service. © 2014 RAE Internet Inc., dba Mailspect and Match My Email, see www.mailspect.com for more information.